Apr - 19 | By: cathydombi | no comments. Bastards y Diablos, with several cast and crew members who hailed from nearby Medford, Oregon, swept both the juried and audience awards for Best Feature. The film is a voyage of self-discovery and reconciliation for two estranged half-brothers told in an unconventional manner. It was shot entirely on location in Colombia, on a budget of only $25,000. The co-star was Dillon Porter, who grew up in Medford. The documentary Mothering Inside by Portland director Brian Lindstrom, won the audience award for Best Short Documentary, and the audience award for Best Feature length documentary went to Voyagers Without Trace, which was directed, produced and written by Ian McCluskey, of Portland. The audience award for Short Film was awarded to The Stairs, which co-starred Oregon Shakespeare Festival (OSF) actor Anthony Heald. Other Pacific Northwest films also received warm receptions at the Ashland film festival, including Honey Buddies, recently renamed Buddymoon, which was shot in the Columbia Gorge, and proved so popular at the film festival that a second screening was added. The film co-stars David Guintoli of the Portland-based TV series Grimm. Other locally-connected films include: The Pearl, a documentary that followed four people from a Pacific Northwest as they transition from man to woman, Boone, a documentary about an organic goat farm in the Little Applegate Valley of Southern Oregon, the short Closure included former OSF company actors David DeSantos and Stephanie Beatriz, while the short Damn, What a Dame was made by students of the Southern Oregon University Film Club, and the executive producer was their teacher Andrew Gay. State support even extended to awards presented to individuals. New this year to the Ashland festival was an award for an emerging female filmmaker, the Juice Award, choreographer Celia Rowlson-Hall, who made her directorial debut with the feature film MA, received the Juice Award for emerging women directors. 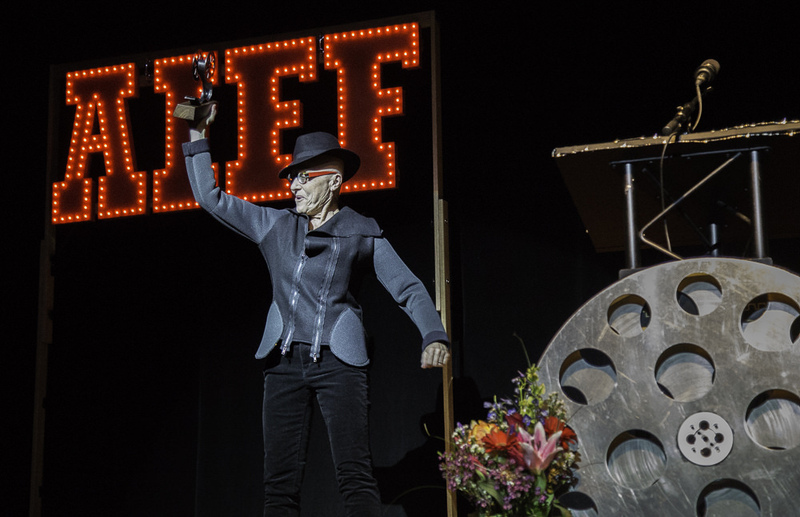 The Juice Award goes to a first- or second-time female director, and is supported by Tangerine Entertainment and the Faerie Godmother Fund of the Oregon Community Foundation.